Join us for a local walk followed by refreshments at The Griffin pub. It's never too early to book your 2018 Christmas Show! Contact Jackie on 07752424914 to book. After a successful first year, the barge trip returns for a second year. Bring your own drinks and picnic! Exact times approximate, Louise will confirm closer to the date. Get in the mood for Wimbledon with some social tennis, strawberries and Pimm's! Always well attended, let's keep our fingers crossed for some sun! Down at the club, join us for some social play with bring your own BBQ. A chance for new members to meet everyone and have a hit with some different faces! Join us for Rothley's first ever pool tournament social! Based at Club 147 Leicester, it'll be a fun team event including an Indian buffet! No prior pool experience needed! Join us for Rothley Ivanhoe's first escape room social! Think Crystal Maze meets the Krypton Factor! Put your wits to the test to breakout of the Escape Room! 60 minutes of clue solving. Approx. £10 per person depending on numbers. UK Escape Games based at Twinlakes Park in Melton Mowbray. A Rothley Tennis Club first! Join us on our first canal trip excursion. Contact Louise on louisechristian@sky.com to sign up! Get ready for summer with a morning/afternoon of social tennis accompanied by strawberries and pimms! Great fun and good tennis (despite the pimms!). A small cost on the day to cover strawberries/pimms! ALL members welcome! A trip to a Leicester Riders game at their new stadium. Contact Jackie or Louise to book your place. Join us for a local morning walk followed by pub lunch. Full details TBC nearer the time. Contact Anne to register your interest. Join us for some cocktails in Leicester! Details to be confirmed nearer the time - check back soon! Please contact Anne if you would like to come! 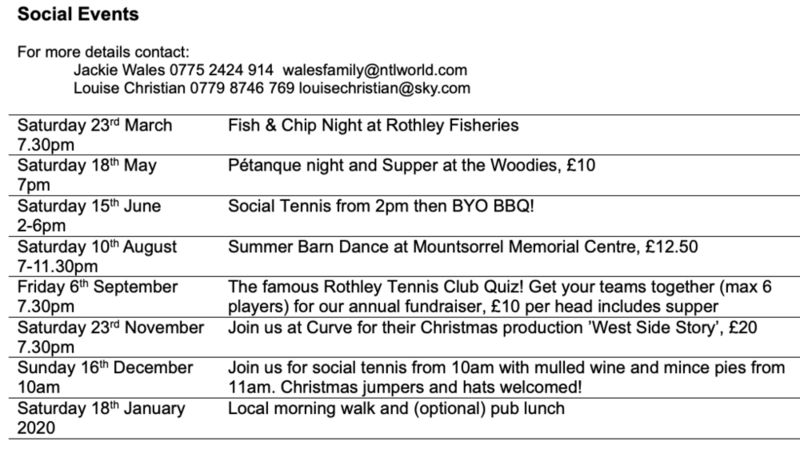 Contact Jackie Wales or Louise Christian for more information on any social events, or to book your place.